In Croft’s early years he joined forces with Cyril Ornadel. 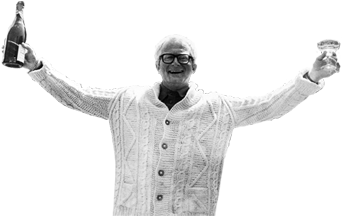 Ornadel was a highly respected and accomplished composer and musical director and together they produced songs for Variety shows for the BBC, as well as a number of very successful pantomimes. Together they wrote two or three hundred songs for BBC Variety; Croft writing the lyrics and Ornadel composing and arranging the music. 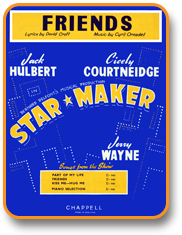 In 1956, building on their success as a team, and Ornadel’s love of musical theatre, Ornadel wrote his first score; a musical called Star Maker with Croft again writing the lyrics. The show was a Jack Hulbert and Cicely Courtneidge vehicle that toured the regions with enormous success. Two years later in 1958 they joined forces again to write The Pied Piper for Gary Miller, which played at the Connaught Theatre, Worthing. It never made it to London due to the premature death of Gary Miller. Max Bacon, the well-known comic also died before the transfer. In 1963 Ornadel again worked with Croft to provide the score for an adaptation of H. G. Wells's novel Ann Veronica, at the Cambridge Theatre, London with Dame Dorothy Tutin and Hy Hazel. This musical also featured wonderful performances by Arthur Lowe and Ian Lavender. The story dealt with contemporary political issues of the time, concentrating specifically on feminist issues. Quite an unusual topic for Croft to tackle! In the course of the action the heroine matures from an innocent and naïve girl to a representative of the ‘New Woman’. The creation of this musical came about when Frank Wells, the son of H.G Wells, agreed to let Croft have the musical rights for a couple of years to see what he could make of it. 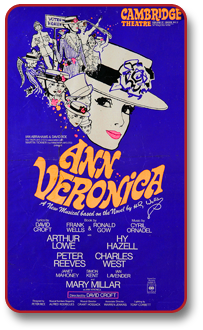 After four years of fund- raising Ann Veronica opened at the Belgrade Theatre, Coventry, and then later transferred to the Cambridge Theatre, London on the 17th April, 1969. The script was written by Frank Wells and Ronald Gow, lyrics by David Croft and music by Cyril Ornadel. Another wonderful Croft / Ornadel collaboration was the production of a selection of the Beatrix Potter tales recorded for radio and the HMV Junior Record Club. The Music was again written and arranged by Ornadel with Croft writing the lyrics for the songs. The stories were narrated by the actress Vivien Leigh. The adaptations were charming and it would take a hard heart not to melt at naughty Peter Rabbit’s wistful "Why do I do it?" and perhaps the utterly delightful “I’m a country mouse” sung by a young David and a premonition as to where he would spend his happiest times. With his huge family in the country!